Not having a lot of known neighbors in our immediate area, my one roommate and I were overjoyed to learn that a few people that we knew from school were living near us. So one of them (Steve. Hi Steve.) had leant me this movie that he assured me was something along the lines of Monty Python, kind of ridiculous, and really thought-provoking. 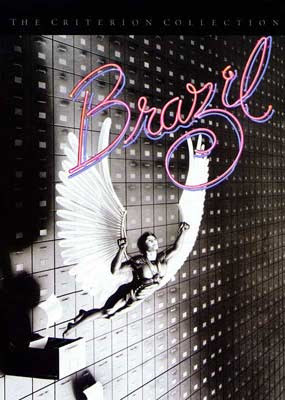 The movie was called Brazil. I did not really understand why for about 9/10 of the movie, and then they kind of appease you in the credits. 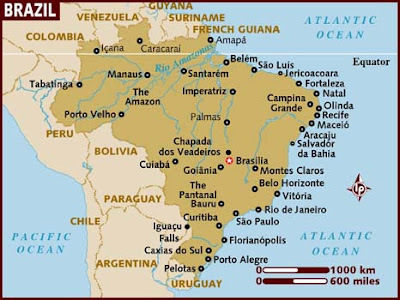 But suffice it to say, it is certainly not about the country of Brazil. This movie is actually set in a retro-futuristic (it makes sense when you see the movie) dystopia in which everything is determined by paperwork. The driving force of the plot is centered around Sam Lowry (Jonathan Pryce), a person working in data entry who finds himself in hot water after trying to right a clerical error. It's also somewhat of a love story, following him as he searches for the girl from his dreams (literally). I really don't know how else to explain the plot without giving too much away, but I gotta say...I didn't really love it. I would like it to write a film paper on maybe, because it is so very different from anything that I've really seen before, but to watch for fun I had some trouble connecting with the characters. Sam Lowry is such a nervous nelly that it's hard to see him as a guy going against the system for both the girl that he loves (Kim Greist) and for the man who suffered because of a typo. Additionally, I feel like I waited for half of the movie to really start up and even twenty minutes before it ended I was waiting for something better to happen. I agree with its commentary on human beings and the importance of not neglecting our own humanity by getting caught up in petty rules and paperwork, but the message was delivered by someone I would probably never vote for in leading a revolution and that made the message less effective. I like you better as Governor Swann. I will say that the set was pretty damn cool. Although it is set in the future, Brazil has the strong feel of the 1950's, complete with primitive computers, ductwork everywhere, and gadgets that look like they came out of Mon Oncle. In fact, even the media there seems old. For instance, the only movies that they watch are vintage classics (Casablanca, Greta Garbo films, etc.) and even though they have computers they still rely almost absolutely on paperwork. It gives a kind of Super Mario Bros (the movie, not the game), mixed with Blade Runner, mixed with Mon Oncle kind of feel to it, if you can imagine that (I know it's hard. I'm sorry. I'm highly associative.). 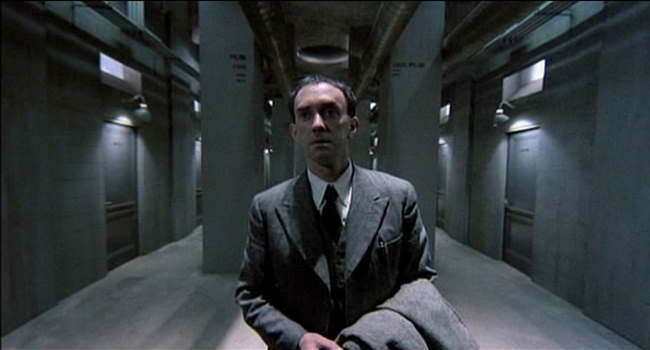 The other thing that stuck out about this movie was the usage of highly surreal dream sequences. These sequences kind of kept the movie alive when I started to get really bored of Sam poorly executing his plans against the government. And it really brightens up the incredibly bleak society that the film portrays. 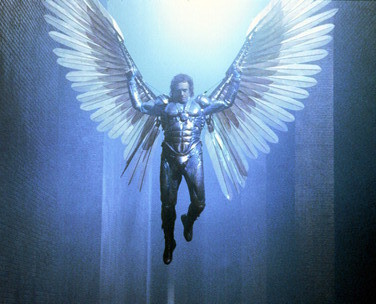 I mean I didn't love this movie, but how cool is this flying suit? The surreal parts of the movie were kind of what kept it interesting. Also if you're watching this and you think the dream sequences are Jim Henson-esque and creepy, wait til the ending, my friends. Wait til the ending. Cuz I was confused for about the last 20 minutes, until the thirty seconds right before the credits. And then the movie makes sense. But really, I gotta tell you guys, I just don't have that much patience. And in hindsight, the film was really interesting but I didn't really enjoy it. Sorry Steve, the best thing I loved about this movie was probably the movie poster that I found when I was looking up the trivia on IMDB. I'm gonna say this movie gets a 5 outa 10 from me. A+ for creativity, but really just wasn't my flavor. Also this trailer probably gives away a little much, but basically outlines the entire movie if you're interested.